Inflexibility of the spine, caused by contractures, is one of the main limiting factors when trying to straighten a curve. 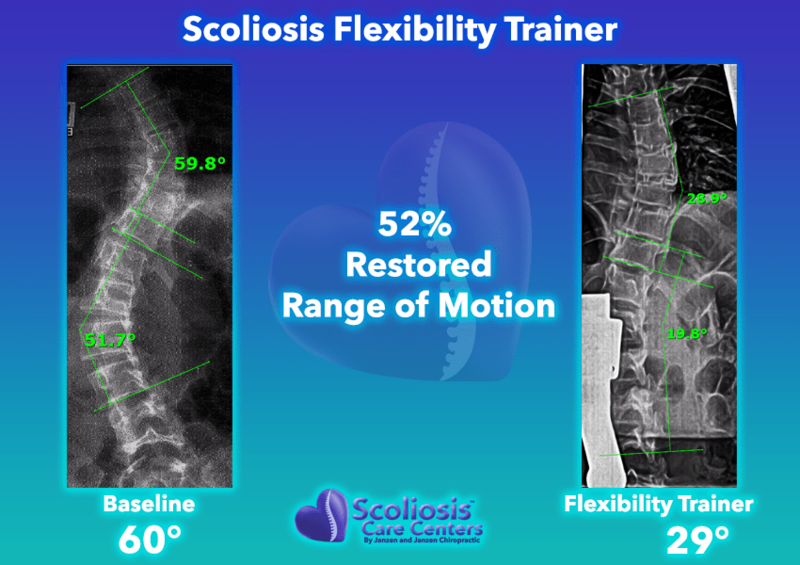 Contractures occur when the spine remains in the scoliotic posture and never gets a chance to exercise its full normal range of motion. If the joints of the spine are not fully exercised, the ligaments and muscles become short and stiff. Muscles, ligaments, and discs become short on the short concave side of the scoliosis and grow long on the long convex side. 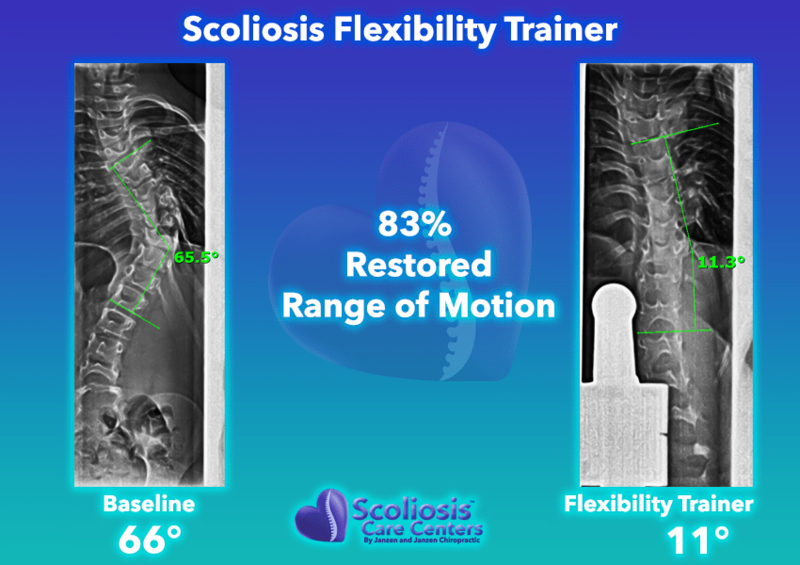 The Scoliosis Flexibility Trainer reverses contractures, restoring flexibility and range of motion. 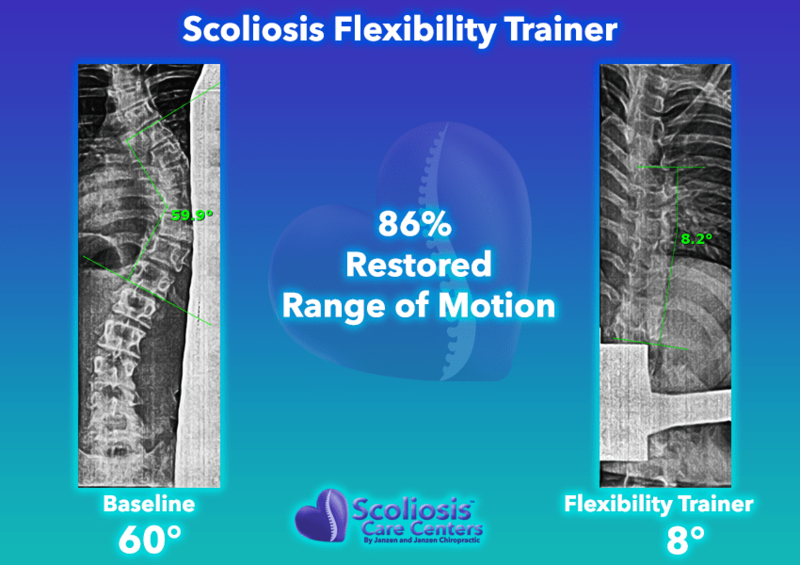 A structural scoliosis is one that has grown stuck in a crooked position due to contractures. The yellow represents tissue that has grown too long and the red tissue that has grown too short. Attempts to stretch or bend out of the curve are met with great resistance. The spine is never exercised throughout its entire range of motion. 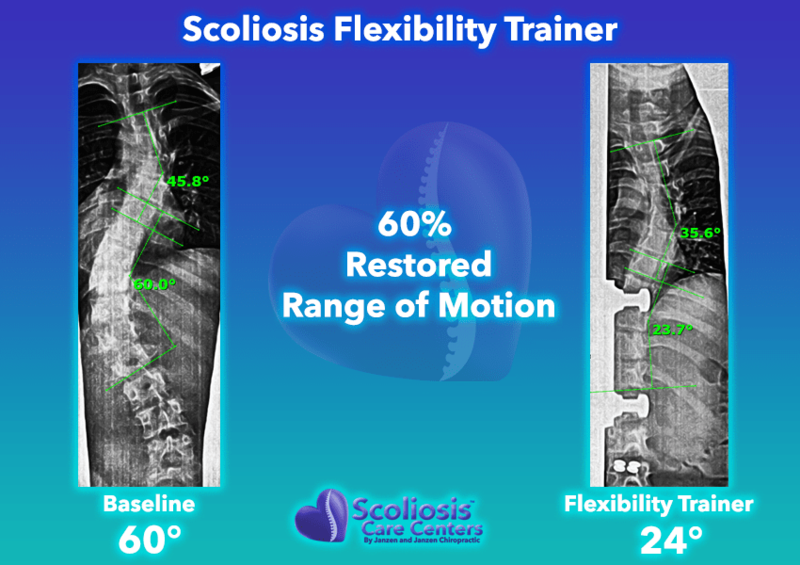 The Scoliosis Flexibility Trainer restores lost flexibility and stretches loose contractures that are binding the spine into a scoliotic posture. Here the spine is being bent 18 degrees opposite the direction of the scoliosis. 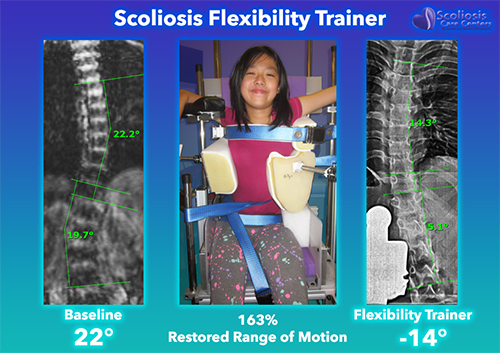 This 18 degrees represents a normal range of movement previously lost due to the scoliosis. 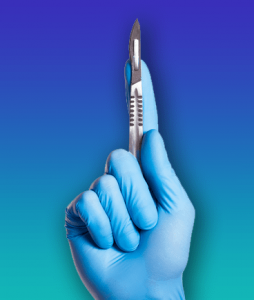 As a standard surgical procedure, a surgeon will simply cut away all the contractures that bind the spine. During a surgery, if a disc, muscle, or ligament is too short and is preventing alignment, the surgeon can simply cut out as much disc, muscle or ligament as is necessary to free the spine. 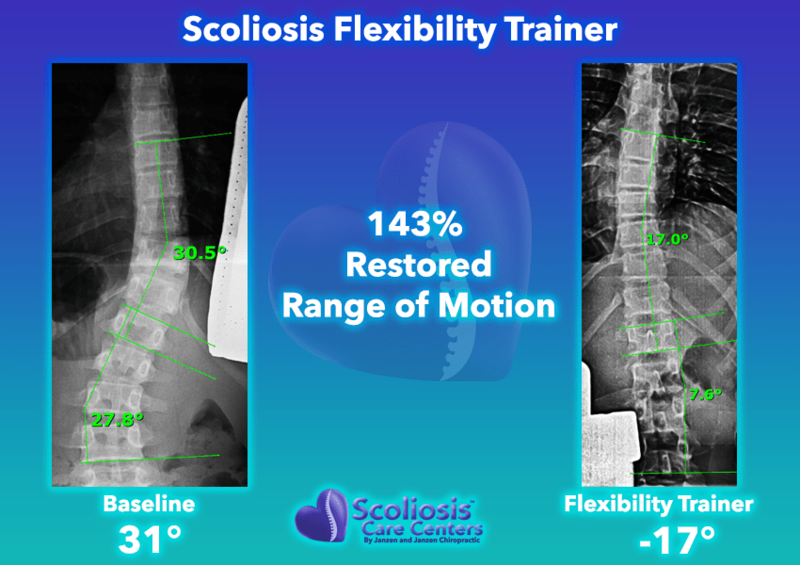 This is one of the major reasons why a surgeon can make a scoliosis straighter with surgery. Contractures are a common occurrence in the body. When a joint, such as a knee, is injured and immobilized in a cast for a long period of time, the range of motion in the knee is lost. Non-surgical treatments for contractures of elbows, knees, and ankles already exist and are commonly used successfully. So, why not treat the contractures of the spine the same way? With this thought in mind, we developed a device that would un-twist and straighten the curved spine; providing non-surgical release of contractures. Releasing the contractures of the spine comes as much more of a challenge. Rather than one or two joints, such as in an ankle or knee, a typical scoliotic spine may have up to 54 joints affected by contractures. Access to these joints is blocked by the ribs, shoulders, abdomen, and pelvis. 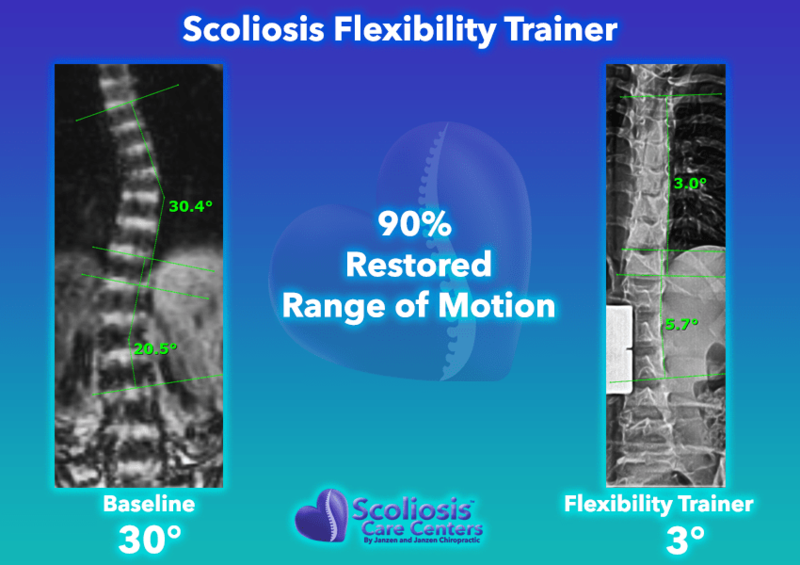 In spite of these challenges, we have successfully engineered an effective solution for nonsurgical release of scoliotic contractures. At this point, we have successfully dealt with two major obstacles to creating a straight spine, a short spinal cord and contractures. The spine is now liberated to move into a straighter alignment. Our next step is to hold it as straight as possible in a highly-corrective brace. 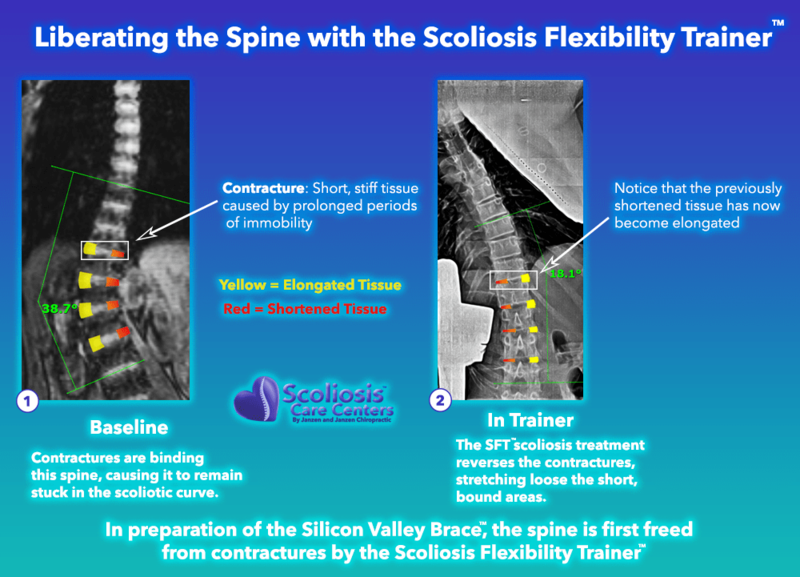 This hyper-correction from the Scoliosis Flexibility Trainer precedes the Silicon Valley BraceTM, allowing better results.